The warriors of ancient Greece were legendary fighters, and many believe they were some of the best fighters, second only to the mighty Spartans. In many ways the Greek warriors and the Spartans shared many similarities, from their armour to their formation strategy and tactics. In battle the ancient Greek warriors were a powerful mass of tactics, training, brute strength and impressive armour. 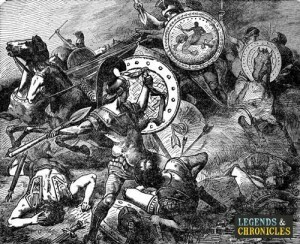 Their battle formation tactics would allow the might Greek hoplites to fight in a protected and effective fashion, just one of the reasons the Greek warriors were so revered. 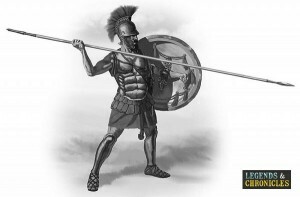 The Greek hoplite was not just your typical foot soldier, the hoplite was a hightly trained, skilled and regimented fighting machine, and when combined with the strong formation of their phalanx the Greek hoplite would be a match for any enemy in battle. One facet of the Greek warriors that helped them garner the success on the battlefield, was their superior armour and weaponry. The Greek warrior would be required to have all the neccessary armour to fight, otherwise they would not be allowed. One weak chink in the hoplite Phalanx formation could spell death for the whole unit, which was why it was so important for them all to be armed correctly to maintain their form. The Greek hoplite would wear advanced armour for the time which was made up from numerous items. Most important to the hoplite was their sheild, without this the phalanx formation would fail. The large shield could be up to, and over three feet in size, rounded, concave and heavy. Built from a solid wooden construction the shield would be heavy at around 15 pounds, and the the rounded concave edge would in many cases have a lip which allowed the hoplite to easily rest the shield on their shoulder. The helmet worn for the Greek hoplites was heavy, protective and crucial to their battle tactics. Commonly known as the Corinthian helmet, it would cover large parts of the hoplite’s head and neck, with guards sweeping down on the nose, and the cheecks moving down to the neck and shoulders. Due to the design and lack of internal structure of the helmet, the Greek hoplites would typically keep their helmets propped up on the head, and only drop them down as they got close to the battle lines due to the weight, heat and discomfort of the helmet. With a hoplite’s shield providing protection to the body, torse and upper legs, the Greaves were an essential piece of kit for the hoplite. The greaves are curved pieces of bronze that the hoplite would affix to his lower legs, from the top of the knee to the ankle. Typically fairly light weight, the greaves would give good protection from leg strikes directed towards the hoplits while fighting. The breastplate, known as a thorax was typically a bronze piece of armour that would encompass the torso in two seperate pieces. The two pieces were typicalling joined with leather ties, and the thorax would stop just above the waist and hips, to provide the hoplite that best movement possible from the waist, while still offering protection for vital organs. The hoplite weaponry was almost standard and uniform, you had a set selection of weapons that each hoplite would carry into battle, allowing them to perform as a unit. The hoplite would have a primary weapon, his spear, commonly refered to as a dory. In addition each hoplite would carry a sword the Xiphos or a Kopis as a secondary weapon for closer range combat. The Greek peltasts were light infantry in the Greek army that would serve as skirmish fighters. Lightly armoured with a shield known as a pelte and an array of spears, and other projectile weapons including slings. The main purpose of the peltats was to cause panic, distract the opponent and provide support to the hoplite phalanxs in battle. The peltasts would often fight to the sides of the phalanx offering projectile support to the close quarter fighting style of the hoplites. While the hoplites were the main force of the Greek army, cavalry did play a small part. Horses at the time of the classical Greek period were generally expensive and not every Greek warrior could afford one. The nature of the Greek landscape also posed problems for horseback riders, the terrain was not wholly suitable, and therefore cavalry was typically used for scouting and in certain circumstances light skirmishing. The Greek archers were another class of light infantry, very similar to the peltasts, they would b e armoured lightly and armed with a bow and arrow. While the Greek archers were skilled at what they did, their techniques were not the best, and their bows were typically weak, lessening the range at which they could attack and rain down arrows on their foe. In battle the Greek archers would be used in a similar fashion to the peltasts, protecting the weak sides of Pahlanxs and adding range and tactical support for the might hoplites. In war the Greek generals would give their warriors the knowledge to fight in a fashion that would allow them to become a dominant force on the battlefield. It was around 650 BC when the generals inotrduced this new battle formation to their troops in the Archaic period. 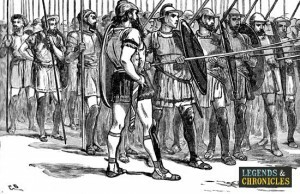 The Greek hoplite warriors would train and fight in a regimented fashion, fighting in a straight line formation shoulder to shoulder with the next Greek warrior. The shields used by the Greek army would allow them to provide cover for their fellow soldier, and in a unison they would march forward, protected from projectile weapons like spears, javelins or arrows from their foe. This formation used by the warriors of Greece was known as the phalanx. The phalanx was a rectangular fighting unit built from the hoplite warriors and would allow the Greek warriors to shift and edit their formation on the fly when required in battle. In battle the phalanx units would be supported by the peltasts and the archers, giving them side support and also providing long range attacks before the Hoplits units would close in. The Greek warriors were mighty and powerful, their strong battle tactics allowed them to best many a foe, and their regimented training and stringent equipment restrictions would allow the Greek warriors to be one of the strongest battlefield opponents a man could face.